Contract Research Organization market size was valued at USD 34.6 billion in 2017 and is expected to witness 7.5% CAGR from 2018 to 2024. 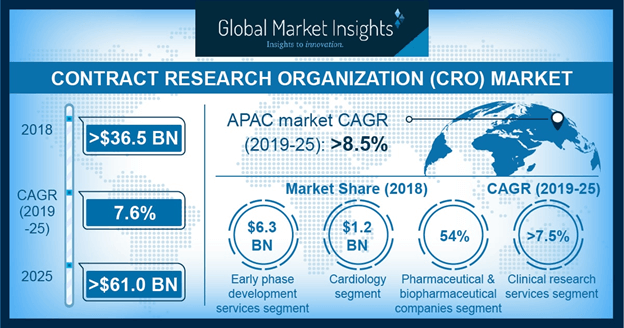 Increasing focus of pharmaceutical companies on novel drug development for treatment of various chronic disease is the major factor driving the contract research organization (CRO) market growth. Pharmaceutical industry is witnessing robust growth owing to drug delivery advancements leading to new product launch. These companies usually outsource their pharmacovigilance activities as setting up in-house pharmacovigilance department is challenging. The paradigm shift of outsourcing clinical trials and related activities to contract research organizations due to cost concerns will boost CRO industry growth during the coming years. Growing investment in life sciences and clinical research will ensure contract research organization market growth over the forecast period. The National Institute of Health (NIH) funding for clinical research increased from USD 11,087 million in 2014 to USD 12,695 million in 2017. Moreover, significant increase in the number of clinical trials is key contributor that will spur CRO market size. According to the Journal of the American Medical Association, overall number of trials registered on the federal database, doubled and reached to 18,400 in 2014. However, issues pertaining to intellectual property rights in technology transfer and institutional research may impede contract research organization industry growth over the forecast period. Clinical research services segment held the largest revenue share of 57.2% in 2017 and is projected to show robust growth over the forecast period. Increasing R&D investment coupled with various government initiatives to support drug development for various chronic diseases will augment the segmental growth. Adoption of clinical trials to determine safety and efficiency parameters will drive the clinical research services revenue size. Early phase development services segment is anticipated to witness highest CAGR of 7.8% during forthcoming years. Discovery of competences in the early phases of clinical trials will positively influence segmental growth in coming years. Oncology segment was valued at USD 18.6 billion in 2017 and will show similar trend during the forecast timeframe. According to the American Institute for Cancer Research in 2018, globally there were 18 million cases of cancer. Increasing burden of cancer has led to an increased investment in R&D of cancer drugs thereby, fostering the industry growth. Ophthalmology segment will witness lucrative CAGR of 10.0% over the forecast period owing to growing prevalence of eye related diseases. Visual impairment is a national and global health concern that negatively affects wide range of population. Furthermore, growing burden of diabetes in developed as well as developing countries will accelerate the need for treatment of various ophthalmic diseases thus, fostering segmental growth. Pharmaceutical and biopharmaceutical companies segment was valued at USD 18.9 billion in 2017 and will exhibit significant growth over the forecast timeframe. High growth can be accounted to increasing prevalence of various chronic diseases such as cancer, cardiac disease, neurological and infectious disease. Increasing investment of pharma and biopharma companies in development of novel drugs will upsurge the demand for CRO services. Medical device companies segment accounted for significant revenue share in 2017 and is estimated to witness 7.4% CAGR during the analysis period. Segmental growth is attributable to growing demand for special CRO services that cater unique needs of medical device and diagnostics companies. Clinical trials play an important role during development and life cycle of medical devices and thereby should drive the industry growth. U.S. contract research organization market accounted for 86.7% revenue share of North America in 2017 and is expected to grow considerably during the forecast year. Growth in innovative treatment for chronic diseases coupled with growing patient concern pertaining to safety and efficacy of drugs increases demand for CRO services. Moreover, high healthcare expenditure and strong foothold of major market players in the U.S. will further augment CRO industry growth. India contract research organization market is estimated to show robust CAGR of 8.8% during the forecast timeline. High growth can be attributed to increasing government support and healthcare reforms in the country. Moreover, increase in outsourcing by pharmaceutical and biotechnology companies from developed countries to Indian CROs will drive Indian contract research organization business growth. 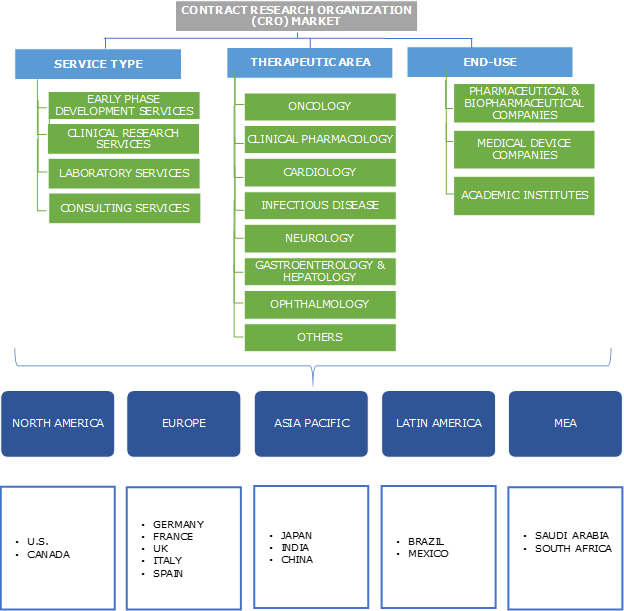 Some of the key industry players operational in the contract research organization market include Charles River Laboratories International (CRL), Clinipace, Clinitec, CMIC, EPS International, ICON, Laboratory Corporation of America Holdings (Covance), Medpace, Parexel International, Pharmaceutical Product Development (PDD), PRA Health Sciences, IQVIA (Quintiles IMS), Syneos Health, Synteract, Worldwide Clinical Trials and Wuxi AppTec. Prominent players implement strategies such as merger, agreement, acquisition and addition of services to existing portfolio to strengthen their market position. For instance, in July 2017, ICON a provider of drug development services and solutions to biotechnology, pharma and medical device industries, acquired Mapi Group. Mapi Group is a health outcomes research consultancy that specializes in late-phase research. The strategy aimed at adding significant commercialization, analytics, real world evidence generation and strategic regulatory expertise to ICON’s existing research business. The concept of CRO market can be traced to the 1940s and 50s with the foundation of companies such as Charles River Laboratories and Huntingdon Life Sciences. These companies provided animals to experiment on, as well as conducted tests in wide range of pharmaceuticals and other scientific areas. Later in the 1960s, increasing regulations for pharmaceutical products increased the need for drug companies to systematically test their compounds. HLS and others increasingly expanded into preclinical toxicology testing for pharmaceutical companies. However, industry began to emerge in its present form in the late 1970s and early 1980s. Companies such as Quintiles and Parexel were founded during this period. These firms have broadened out from traditional preclinical testing role into clinical trials, logistics, statistics, data management and other functions. The 1990s saw an explosive CRO services market growth, rising from around 4% of R&D expenditure in the early 90s, to about 50% in the mid-2000s. However, as market started growing, the role of CRO shifted again, becoming more strategic and playing a more long-term role in the development process. This strategic relationship is reflected in increasing range of services being offered ranging from discovery, clinical and preclinical testing, regulatory approval to healthcare communications at the end of the process. With advent in technology as well as growing concerns regarding safety and efficacy of products, the CROs market will continue to grow over the forthcoming years.